Pyrotechnicians often add metal salts to make colorful fireworks. Here’s where that color comes from: Heating atoms of sodium, barium or strontium pumps energy into the electrons whizzing around each nucleus. Those energized electrons shoot up to higher locations in the atom. As they fall back down to their usual positions, the electrons lose their extra energy as visible light. Loud bangs come from confining the explosions in a shell, much like a grenade. Gases expand faster than the speed of sound when the shell bursts, creating a loud sonic boom. An abandoned recipe for crackling fireworks called dragon eggs shows how chemists control the ingredients in the firework to get sound effects too. The oxidizing agent in this recipe is lead oxide, which becomes lead atoms as the firework burns. These atoms vaporize in the flame. And those vapors create off little crackles as they expand. Whistling fireworks are more tricky. Pyrotechnicians need to find the right ingredients so that the mixture burns just enough to push air out of its tube — but doesn’t detonate with a bang. The starburst patterns of fireworks depend on how the designers pack explosive pellets into a shell. For a look at the innards of a firework before it explodes, check out this diagram from NOVA Online. In case you’re worried about the environmental effects of the perchlorate oxidizers or metal colorants, fear not. 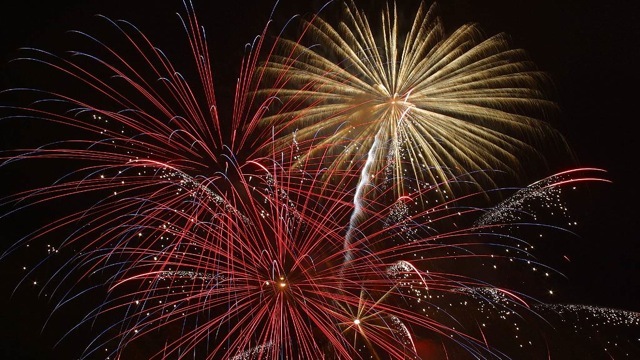 Chemists are developing recipes for environmentally-friendly fireworks too. Enjoy the fireworks this holiday and stay safe! For those looking to host their own fireworks shows, check your local laws first. It’s illegal where I live. Whoops! Thanks for catching that. It’s been fixed now. “Fear not” about the environmental and human health impacts? Did you actually research this question? You flippantly dismiss the toxic stew that rains down on our land and waters, and encourage us to scamper along to the fireworks show in ignorance. A few minutes of surfing reliable sources will give you some facts. Shame on Quest for this level of “science” news. Melissae Fellet is a freelance science writer obsessed with electrons, atoms and molecules. Writing about chemistry, physics and technology, she hopes to reveal how the invisible building blocks of matter influence things like plastics, perfumed shampoos and the speedy computer chips we use everyday. She holds a BS in biochemistry and microbiology from the University of Florida and a PhD in chemistry from Washington University in St. Louis. She spends sunny days at her home in Santa Cruz either watching otters in the bay or tromping around the redwood forests. Prev Spend Your Summer as a Bay Area Citizen Scientist Next Is Ecotourism Helping or Hurting Our National Parks?